Tag Archive | "biggest art fraud in history"
As if all that we have covered in earlier chapters of this long story were not enough, Yank Barry also perpetrated what is regarded by some art scholars as one of the biggest—if not the biggest—art fraud in all of history, a fraud that saw Yank Barry acquiring ten sets of 74 sculptures (or a total of 740 sculptures), all of which purported to be genuine bronze casts of sculptures by the famous artist Edgar Degas, and then immediately claiming that one set of 74 sculptures was alone worth $37.33 million, while some later reports suggested that all 740 sculptures could be worth as much as $533 million, when the truth was that Yank had paid only $1,369 for each of those sculptures (or around $1 million for all 740 sculpture), and none of the sculptures were, in fact, authentic works of Degas. Yank purchased the sculptures from an outfit called the Degas Sculpture Project, which claimed to have discovered previously unknown and genuine plasters of Degas sculptures at a foundry in Paris, and then contracted the foundry to mold from the plasters the ten sets of bronze sculptures, with 74 sculptures per set (for a total of 740 sculptures). The owner of the Degas Sculpture Project was a man named Walter Maibaum, and unsurprisingly, Maibaum was a close associate of Yank Barry. The foundry that made the sculptures from the alleged Degas plasters was a controversial foundry called the Valsuani Foundry. Maibaum told me that Yank Barry had nothing to do with having the alleged Degas sculptures made at the foundry, but Yank Barry at least claimed that he dealt directly with the foundry, and that he acquired additional sets of alleged Degas sculptures from this same foundry. Either way, Yank and Maibaum are in agreement that the first set of 74 sculptures alone is worth at least $37.33 million, while there have been reports, likely planted by Yank, that all ten sets of sculpures (i.e. all 740 sculptures acquired by Yank) could be worth as much as $533 million (i.e. more than a half billion dollars). It is unclear whether the Valsuani Foundry made more than ten sets of the sculptures, though Yank has claimed that he acquired directly from the Vulsuani Foundry some number of additional sets beyond the tens sets that he purchased from the Degas Sculpture Project. Maibaum of the Degas Sculpture Project has stated that he was directly involved with the operations of the Valsuani Foundry, and, of course, it was the Degas Sculpture Project that contracted with the Valsuani Foundry for the manufacture of at least the ten sets of sculptures that the Degas Sculpture Project ultimately sold to Yank Barry. The man described as the Valsuani Foundry’s “driving force,” however, is Leonardo Benatov, who claims to be a descendent of Armenian-Russian royalty and who recently adopted the name Prince Leonardo Argoutinsky-Dolgorouky. In addition to adopting the persona of a Russian-Armenian prince, Benatov often states that he is related by marriage to a family of cannibals in Brazil. I have been unable to confirm Benatov’s claims, as there is, in fact, no documentation supporting any of it (or, at least, no documentation that has been made public), but since I have also been unable to prove that Benatov’s claims are false, we shall start by simply accepting at face value the story thus far: that Leonardo Benatov is a Russian-Armenian prince (Prince Leonardo Argoutinsky-Dolgorouky) who was, for two years, held captive by a tribe of cannibals in Brazil, and who, while in captivity, married the daughter of the tribal chief, himself a cannibal, before escaping, and later in life, at the behest of Walter Maibaum, if not also Yank Barry, manufactured at least ten sets of putatively genuine Degas sculptures, with reports that those ten sets of sculptures are worth as much as $533 million. The alternative, as the reader should know by now, is that we might not believe any story associated with Yank Barry, who is, as I have already established, the world’s greatest con. In any event, after acquiring his first set of 74 alleged Degas sculptures, Yank Barry produced an appraisal from a New York art dealer named Stewart Waltzer, who reported that the first set of 74 sculptures was, in fact, worth no less than $37.33 million. The appraisal reported further that just one of those sculptures, which purported to be a genuine bronze cast of a sculpture called Little Dancer at Aged Fourteen, the most prized Degas sculpture of all, was alone worth no less than $15.33 million. When other art dealers began questioning the authenticity of the sculptures, it emerged that Waltzer had been paid by Yank Barry himself to produce his appraisal, but that emerged later, long after Yank had perpetrated his fraud. Meanwhile, Yank told people that his Global Village Champions Foundation had paid up to $20.33 million for the first set of 74 sculptures (valued at $37.33 million, according to Waltzer’s appraisal), and Yank began selling the sculptures for “charity.” It was flatly untrue that Yank paid anywhere close to $20.33 million: He paid only $400,330 for the first set of 74 sculptures, as we will discuss in a moment. The Global Village Champions Foundation also began selling raffle tickets over the internet with promises that all of the income from this raffle would go to child victims of a devastating earthquake in Haiti, and that winners of the raffle would take home various Degas sculptures, while one lucky winner would take home the most celebrated Degas sculpture of all, the Little Dancer. Yank said he expected that so many people would buy the raffle tickets that the raffle would earn around $100 million for the Global Village Champions Foundation (which would, according to Yank, use the money to feed Haitian earthquake victims, most of them children). But Haitian earthquake victims never saw a dime from Yank, and the background to this raffle was partly revealed in a 2013 lawsuit that the Degas Sculpture Project filed against Yank Barry and the Global Village Champions Foundation. The Degas Sculpture Project, as we know, had sold the first set of supposed Degas sculptures to Yank Barry (or, more specifically, to Yank’s ‘charity,” the Global Village Champions Foundation), and in its lawsuit, the Degas Sculpture Project claimed that it had signed a contract with Yank on November 15, 2008 whereby the Global Village Champions Foundation would purchase at least two sets of 73 Degas bronze sculptures with an option to buy eight additional sets. From that contract, another two contracts followed: a February 2009 confidentiality agreement and a November 2009 purchase of 10 sets of 74 “Valsuani Edition” Degas bronzes, including one cast of the celebrated Little Dancer in each of the ten sets. In its lawsuit, the Degas Sculpture Project revealed that Yank, through the Global Village Champions Foundation, had paid only $1,o13,330 for all of the sculptures in his possession. Elsewhere, Maibaum, owner of the Degas Sculpture Project, clarified that Yank had paid only $400,330 for the first set of 74 Degas sculptures, including the Little Dancer, and subsequently paid a bit more for the additional sets of Degas sculptures, with his total payment being $1,013,330. When Yank placed some of these sculptures on consignment with prominent art galleries, he consistently told owners of the galleries that his sculptures were worth millions of dollars, so, for example, when he placed 12 of his supposed Degas sculptures on consignment with a gallery in Sarasota called R&R Bond Galleries, he told the owner of that gallery that he had paid $17.33 million for the 12 sculptures (when he had, in fact, paid about $18,000 for them). In one of several phone conversations I had with Yank Barry, he admitted to me that he had paid only “around $1 million” for all ten sets of the sculptures (despite the fact that he had publicly stated that he paid up to $2o.33 million for just the first set of 74 sculptures alone), but he stated that his payment of “around $1 million” was just a down payment, and that he had returned all of the sculptures to Maibaum of the Degas Sculpture Project after he learned that the sculptures might not be authentic. At the same time, however, Yank insisted that the sculptures are, in fact, authentic, and we will see that, to this day, he is still offering many of those sculpture for sale, telling people that they are master works of art, worth many millions of dollars. In other worlds, not only do the facts show that Yank Barry was lying to people, but also, given the facts that he has acknowledged to me on the phone, he himself knows and unwittingly admits that he was lying to people. The Degas Sculpture Project was, of course, stating the obvious—the Global Village Champions Foundation was “an instrumentality of fraud” (see Chapter 2 of this article)–but the Degas Sculpture Project subsequently “settled” the lawsuit and retracted its earlier statements about the Global Village Champions Foundation. Well, the Degas Sculpture Project was in cahoots with Yank from the beginning. The owner of the Degas Sculpture Project, Walter Maibaum, was a close associate of Yank Barry, and Maibaum had been involved with the Global Village Champions Foundation. Maibaum and Yank apparently had a falling out, which caused Maibaum to file a lawsuit in which he came clean (at least partially), but then events transpired that made him flip back to supporting Yank Barry’s con. Maibaum had been working closely with Yank to perpetrate the fraud described above, which fraud at its core amounted to Maibaum (and Yank Barry, if we believe Yank) working with a foundry to manufacture hundreds of alleged Degas sculptures, including sculptures that purported to be casts of the most celebrated Degas sculpture of all, the Little Dancer, and then selling many of these fake sculptures, including the Little Dancer, through a Global Village Champions Foundation raffle purportedly for the benefit of children victimized by a terrible earthquake in Haiti, though no earthquake victims would see a penny. In addition, by controlling the secondary market in Degas sculptures, and by placing some of his Degas sculptures in prominent galleries, including R&R Bond Galleries, Yank Barry intended to convince the world that he was the world’s leading dealer in Degas sculptures, that his sculptures were genuine works of Degas, and that his sculptures were worth millions of dollars. Maibaum helped Yank Barry secure the fraudulent appraisal stating that the first set of 74 sculptures, including the Little Dancer, was worth no less than $37.33 million, and Yank, of course, stated that he expected to raise no less than $100 million by raffling off that first set of 74 sculptures. This despite the fact that Yank had paid no more than $400,330 for those sculptures, as was noted by Maibaum, though Maibaum, like Yank, claimed that this was just a down payment, while Yank maintained the fiction that he had paid up to $20.33 million for the first set of 74 sculptures. Not only was Maibaum (founder of the Degas Sculpture Project) involved with the Global Village Champions Foundation, but Maibaum was also a 2010 winner of the Gusi Peace Prize, while another winner of the Gusi Peace Prize in 2010 was Yank Barry. Both Yank and Maibaum received their awards at a ceremony in the Philippines, right at the time when they launched the raffle of the supposed Degas sculptures, and this ceremony was held with much pomp and circumstance. If you do a quick Google search, you will find that there are numerous websites referring to the Gusi Peace Prize as being the Asian equivalent of the Nobel Peace Prize, but most of those websites were created by either Yank Barry or his associates. You will also find that Yank, at every opportunity, promotes himself as being a winner of the Gusi Peace Prize, saying that this is the Asian equivalent of the Nobel Peace Prize, but the Gusi Peace Prize most certainly is not the Asian equivalent of the Nobel Peace Prize. The Gusi Peace Prize was established by one of Yank’s cronies, a guy named Barry Gusi, whose greatest claim to fame is that he was once a runway fashion model for the Armani clothing company. To be an Armani fashion model in the Philippines is about as prestigious as being a model for Fruit of the Loom underpants in the United States. Which is to say that Barry Gusi is not quite Alfred Nobel. To be fair, while his greatest claim to fame is having been a fashion model, Gusi also claims to have once been the Philippine ambassador to Micronesia (a micro country), but it is clear that the Gusi Peace Prize, far from being the Asian equivalent of the Nobel Peace Prize, was set up to for the specific purpose of promoting Barry Gusi’s cronies. Rounding out the winners of the Gusi Peace Prize in 2010 was the famous Michael Nobel, who, of course, was another member of the Global Village Champions Foundation advisory board. Nobel was awarded the Gusi Peace Prize for “Education and Humanitarianism.” As we know from Chapter 3, Michael Nobel was no humanitarian, but he did “educate” the public by promoting Yank Barry’s ProPectin miracle cure, falsely claiming that ProPectin could rid the human body of radioactive contamination, meanwhile describing himself (falsely) as the “patriarch of the Nobel Peace Prize”. When the Degas Sculpture Project filed its lawsuit against Yank Barry and the Global Village Champions Foundation, The National Post newspaper in Canada had recently published its story (“The World According to Yank”) casting doubt on Yank’s “alleged good deeds,” and Yank had filed a libel lawsuit against The National Post, while threatening to sue anyone else who suggested that the Global Village Champions Foundation was a fraudulent organization. The Degas Sculpture Project’s retraction (confirming that the Global Village Champions Foundation was a “very worthy charitable organization that works to eradicate hunger around the world”) served not only to reinforce the notion that the Global Village Champions Foundation was a legitimate charity, but also communicated the message that Yank Barry would emerge victorious from any lawsuit related to the legitimacy of his charity. Furthermore, the retraction of the Degas Sculpture Project’s lawsuit reinforced the notion that the Degas sculptures purchased by Yank were authentic—which they were not. This was precisely the same message that Yank was delivering at the time. It must be stressed, however, that the Degas sculptures were not authentic. (In the art world, bronze sculptures are said to be “authentic’ when the artist himself had authorized the production of bronze sculptures from his plasters, which Degas had not). Yank Barry was quoted in this ARTnews article as telling author Cohen that he paid “between $7 million and $20 million” for the first set of 74 sculptures, and previously, of course, Yank had advertised that he had paid up to $20.33 million. Meanwhile, Yank was still insisting the first set of 74 sculptures was worth $37.33 million, the figure cited in the Stewart Waltzer appraisal. In other words, Waltzer refused to confirm the authenticity of the sculptures, but nonetheless appraised them as if they were authentic—and worth an astounding $37.33 million. Cohen wrote that “one expert who didn’t want to be identified wrote in an e-mail to ARTnews that the Waltzer appraisal provides ‘a very distressing backstage view of the confusion and delusion that has been perpetrated’” against the world of art by people [i.e. Yank] dealing in these supposed Degas sculptures. Indeed, it should not have been on the internet, because it was a fraud. It might not have been a fraud in the legal sense since Waltzer carefully parsed his words (“these works have been appraised as authentic works by Edgar Degas. This appraiser and this appraisal [do] not warrant the authenticity of the 74 Edgar Degas sculpures…), but it was a fraud in every other sense of the word, in that it nonetheless suggested that the sculptures were worth $37.33 million, which they most certainly were not. And whether or not Waltzer himself can be held legally liable for this fraud (he can always claim that he was acting under the assumption that the sculptures might be authentic), Yank Barry was certainly perpetrating a fraud in the legal sense of the word, since he knew full well the origins of the sculptures, and the fact that he had paid only around $400,000 for that first set of 74 sculptures. Cohen wrote that Yank claimed he had returned the money that he had raised from the raffle after he learned that that there were questions about the authenticity of his supposed Degas sculptures, but at the same time, Yank told Cohen that he was still convinced that the sculptures were, in fact, legitimate. And after Cohen published this article, Yank began threatening lawsuits against anyone, including ARTnews, who dared continue to assert that the sculptures were not authentic. Meanwhile, of course, Yank continued to point to the Waltzer appraisal as evidence that the one set of 74 sculptures, including the Little Dancer, was, in fact, worth no less than $37.33 million (while the full ten sets of supposed Degas sculptures were, according to reports likely sourced from Yank, worth as much as $533 million). Then came the Degas Sculpture Project lawsuit, and recall that while the Degas Sculpture Project lawsuit correctly described the Global Village Champions Foundation as an “instrumentality of fraud,” the lawsuit went to lengths to describe the alleged Degas sculptures that Maibaum sold to the Global Village Champions Foundation as authentic “master works of art.” When this lawsuit was filed, Yank began threatening lawsuits against other journalists who had picked up on the ARTnews story to report that the sculptures were not authentic. Yank also began to threaten lawsuits against even some of the nation’s most prominent art experts who questioned the authenticity of the sculptures and, to their dishonor, they began folding. In addition, Yank began telling people that he had filed a libel lawsuit against The National Post for its story (“The World According to Yank”) casting doubt on Yank’s “alleged good deeds,” and, of course, the Degas Sculpture Project quickly “settled” its lawsuit, demonstrating that Yank would emerge victorious in any legal case having to do with the legitimacy of the Global Village Champions Foundation. Recall that Yank also filed a $10 million lawsuit against Wikipedia and the Wikipedia editors who had recently tried to report that Yank’s charity was dubious, that Yank wasn’t a member of the Kingsmen, and that Yank had been implicated in various crimes. Not incidentally, those Wikipedia editors had also reported on the scandal surrounding Yank’s alleged Degas sculptures. When the Degas Sculpture Project subsequently “settled” its lawsuit and issued its retraction, Yank Barry, of course, portrayed this as a victory, one that demonstrated conclusively that the Global Village Champions Foundation was a legitimate charity, contrary to the revelations in The National Post and the revelations on Wikipedia (before Yank Barry trolls seized control of the editing of his Wikipedia page) and that the Degas sculptures he was selling were entirely authentic “master works of art.” And to repeat: because he “won” the lawsuit that the Degas Sculpture Project had filed against him, Yank was able to convince people that he would emerge victorious in any lawsuit concerning his charity and business, including his art business. It might well be that the Degas Sculpture Project filed its lawsuit precisely so that Yank could say that he “won” the lawsuit. Alternatively, the Degas Sculpture Project genuinely had a dispute with Yank, but quickly realized that there was nothing to gain from the dispute. Either way, the result of this lawsuit was to benefit Yank, and after the Degas Sculpture Project filed and then quickly settled the lawsuit, the Degas Sculpture Project continued to help Yank perpetrate his massive fraud on the world of art. Yank, meanwhile, continued to flaunt the appraisal valuing his first set of 74 alleged Degas sculptures, including the alleged Little Dancer, at $37.33 million, and he continued to report that he had paid up to $20.33 million for those 74 sculptures, despite the fact that he had paid $400,330, and despite the fact that most art experts questioned the authenticity of the sculptures, though now the art experts had caved to Yank’s threats and were no longer willing to speak out against the fraud for fear that Yank would hit them with a bogus libel lawsuit. Maibaum did say that his Degas Sculpture Project had “made no such plans” with the Global Village Champions Foundation to raffle off many of the Degas sculptures, knowing that the Degas sculptures were not worth the amount cited by the Waltzer appraisal. This, of course, contradicts the statement in the Degas Sculpture Project lawsuit that the Degas Sculpture Project had “relented” and agreed to participate in the Global Villlage Champions Foundation raffle after Yank agreed to give the Degas Sculpture Project full ‘editorial control” over the raffle. The only prominent museum to even consider exhibiting the Degas sculptures was, as Maibaum mentioned, the Hermitage museum in Russia. But far from confirming that the Degas sculptures commissioned by Maibaum were authentic, the Hermitage simply invited art scholars to a “colloquium” to discuss what were described as Maibaum’s “controversial” Degas sculptures. The colloquium was entitled “Posthumous Bronzes in Law and Art History,” and the plan was for art scholars to debate what, if anything, should be done about the “controversy” surrounding Maibaum’s sculptures (740 of which had been purchased by Yank Barry for around $1 million, or less than $1.500 apiece). Some prominent art experts, including Veronique Wiesinger, director of the Alberto and Annette Giacometti Foundation in Paris, urged other scholars to boycott the colloquium because there was no longer any “debate” about the authenticity of the sculpures. Art experts were nearly unanimous that the sculptures were not authentic, and Wiesinger, among others, did not want scholars to give any credibility to the claims of Maibaum and friends, including Yank Barry, by continuing to discuss the matter. Maibaum has claimed that ten other “heirs” have authenticated the alleged Degas sculptures. The names of those ten other “heirs” are unknown, and, in any event, it is not up to heirs to decide whether an alleged Degas sculpture is authentic or not. It is up to experts, who determine whether Degas himself would regard the sculptures as authentic, and clearly the experts are nearly unanimous that Degas would be appalled by Yank Barry’s commerce in the alleged Degas sculptures. Finding heirs to put their stamp of approval on the alleged Degas sculptures does, however, give Maibaum and Yank Barry some legal cover, and perhaps the heirs were enticed to cooperate with claims that the sculptures commissioned by Maibaum and Yank could be sold for as much as $533 million. Recall that Maibaum wrote to me that the Degas sculptures were “authentic,” and Maibaum wrote, “to the best of my knowledge no one has actually reported that the Degas sculptures are not authentic…” Yank Barry also told me that the Degas sculptures were authentic and that nobody had reported that the Degas sculptures were not authentic. It is, in fact, true that few prominent art scholars have gone on the record to say that the sculptures are not authentic, but it is also clear that Degas experts throughout the world are nearly unanimous that the sculptures are not authentic, and their reasons for not going public with their opinions were made clear in numerous reports. The experts at this meeting (i.e. the most prominent Degas experts in the United States) were unanimous that Yank Barry’s Degas sculptures (purchased from Maibaum, and promoted with Maibaum’s help) were not authentic, but Cohen noted that beginning in 2011 (when Yank Barry started issuing threats of legal action), “none of the participants in the meeting would speak with me on the record, nor would they confirm that it [the meeting] had in fact occurred, what transpired there or what they intended to do, if anything” about the bogus Degas sculptures. This should be stressed: the most prominent Degas experts in the United States were in unanimous agreement that the Degas sculptures obtained by Yank Barry were not authentic “master works of art,” but not one of those experts would go on the record as stating that the sculptures were fakes. Indeed, Degas experts around the world knew the sculptures were not authentic, but few went on the record to state the truth. In sum, the most prominent experts in the world of art had been cowed by…Yank. As a result, there were only a few stories in the media, including the two stories by Cohen, casting doubt on the authenticity of the sculptures, and just as the few stories exposing Yank’s other frauds were ignored by the world at large, so too did the world at large ignore the few stories exposing the massive fraud that Yank perpetrated against the world of art. Naturally, Yank got away with the fraud and continues to sell fake Degas sculptures as though they are authentic. But this prominent expert, of course, spoke only on the condition of anonymity. He and nearly every other prominent expert in the art world had been frightened into submission by…Yank. And they continue to be cowed to this day, while Yank continues to sell off the remaining Degas sculptures, advertising them as being worth millions of dollars. “Additionally,” wrote Arsenau, “under Association of Art Museum Directors’ endorsed…ethical guidelines: ‘any transfer into new material unless specifically condoned by the artist is to be considered inauthentic or counterfeit.’ The dead don’t condone.” Degas, who, of course, is dead, never condoned the creation of bronze sculptures in his name, and so Yank’s sculptures were, of course, 100 percent counterfeits. Nonetheless, and perhaps not surprisingly, many journalists have helped Yank pull off his Degas sculpture fraud, just as they have helped Yank pull of his other frauds. Do a quick Google search, and you will find stories in the media describing Yank as a prominent art collector, and a leading collector of sculptures by Degas. In one recent news broadcast, a journalist visited Yank Barry’s home in the Bahamas, where Yank was holding a show for prospective buyers of his remaining supposed Degas sculptures, and the journalist reported Yank’s claim that his remaining Degas sculptures were master works of art. The journalist also repeated Yank’s claim that the sculptures were each worth millions of dollars (though Yank bought those sculptures for less than $1,500 apiece). At the time of that newscast, Yank had, of course, already offered at least 50 of the sculptures for sale through the Global Village Champions Foundation’s raffle, with the profits of this raffle ostensibly used to feed children who were victims of a terrible earthquake in Haiti. Yank told me that he had returned the money that he raised from that raffle when people began questioning the authenticity of his supposed Degas sculptures, but Yank, of course, continued to maintain that his Degas sculptures were authentic, and he continued to maintain that his profits from the sales of his Degas sculptures would go to charity, just like the profits from his other lines of business supposedly went to charity. So to summarize: The Degas Sculpture Project (and also Yank Barry himself, if we are to believe Yank) commissioned a foundry in Paris to mass-produce a 740 counterfeit Degas sculptures, for which Yank’s Global Village Champions Foundation ultimately paid roughly $1 million. Notably, the foundry in Paris (i.e. the Valsuani Foundry) was, at least, honest enough to label these sculptures as “reproductions,” but Yank, with the help of the fraudulent Walzer appraisal and the Degas Sculpture Project’s Walter Maibaum (winner, along with Yank, of the bogus Gusi Peace Prize), advertised these sculptures as “master works of art” worth many millions of dollars. With such help, Yank was able to convince a lot of people that just one of the sculptures, the Little Dancer, was worth $15.33 million, and that his first set of 74 sculptures, including the Little Dancer, was worth a total of no less than $37.33 million. This was a clear-cut case of art fraud, and this alone, it should be stressed, was a felony offense—a jailable offense. Meanwhile, Yank told people that he paid up to $20.33 million for the first set of Degas sculptures, and he had purchased an additional nine sets of Degas sculptures, with all ten sets reported to be worth as much as $533 million, though the truth was that Yank had paid no more than $400,330 for the first set of 74 sculptures, and a total of around $1 million for all ten sets of sculptures. 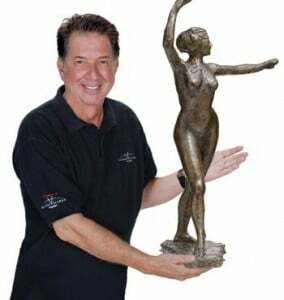 While Yank advertised one of the Little Dancer sculptures alone as being worth $15.33 million, he paid no more than $1,500 any of these sculptures. Keep in mind also that Yank Barry had his counterfeit sculptures shipped from France to the United States, and he shipped some of the sculptures from the United States to the Bahamas, if not also to other countries. Did the shipping documents describe those sculptures as authentic Degas sculptures? If so, that is another crime. Did Yank declare in the shipping documents the accurate purchase and likely sale price of the sculptures? If he claimed the inflated value, that is another offense (lying on records one submits to any government is generally a felony). If he truthfully declared in the documents that he paid only $400,330 for the first set of 74 sculptures, including the Little Dancer, the documents are not only more proof of his fraud (since he told potential buyers and the wider public that he paid up to $20.33 million for the sculptures), but also evidence of tax evasion (since he didn’t pay duties commensurate with his expected resale price of the sculptures). If he declared in the shipping documents that he paid $20.33 million for sculptures worth $37.33 million, he was, of course, making a false declaration (since he paid only $400,330), which was also a violation of the law. Shipping counterfeit art around the world is no joke. People without friends in the justice system have spent years in prison for that crime. And make no mistake: Yank Barry was (and, until this day, still is) trafficking in counterfeit art under the guise of charity, and it might well be that Yank Barry operates theGlobal Village Champions Foundation for precisely that purpose, among other similar reasons. We already know that the Global Village Champions Foundation was used to promote the fraudulent company Biochem Solutions, and we know that the Global Village Champions Foundation has been used to promote Yank’s other dubious businesses, including his ProPectin miracle cure. So it is plausible that one of the Global Village Champions Foundation’s current purposes is to promote and serve as cover for Yank’s fraudulent art business as well. Yank also stated that he expected to take in $100 million for child victims of the earthquake in Haiti by raffling off at least 50 of his supposed Degas sculptures, including the Little Dancer, and though he said he returned the money that he raised in that raffle, he continued to maintain that the Global Village Champions Foundation had paid up to $20.33 million for the first set of 74 sculptures. In addition, and perhaps worst of all, Yank Barry continued to exploit the plight of hungry children, suggesting that his commerce in the Degas sculptures (all of which had been purchased by the Global Village Champions Foundation) was for the purpose of raising money for his charity, which was “striving to become the undisputed world leader in private, humanitarian delivery of nutrition” to needy children everywhere. Yank certainly made money selling his fake Degas sculptures, but there is no evidence that any of that money was used to feed needy children. That, too, was a jailable offense. My only question: How many years in jail for ripping off starving children?